Though smartphones still outsell tablets worldwide, tablets are picking up the pace quickly, and mobile developers are noticing that. Mobile app makers are almost equally interested in developing for tablets as smartphones, according to the Appcelerator/IDC Q2 2013 Mobile Developer Survey published Friday. That’s the first time developers surveyed have exhibited matching interest in both mobile platforms. The survey is usually a good look at how developers are thinking about the viability of different platforms and markets. Appcelerator and IDC gathered the survey data between April 18 and April 22 from 6,046 Appcelerator Titanium developers. The survey revealed that 84 percent of developers are interested in developing for smartphones, and 81 percent for tablets. When broken down among by platform preference, iOS(s AAPL) and Windows(s MSFT) developers show nearly the same level of interest in making smartphone apps as making tablet apps (smartphone apps are preferred by less than 2 percentage points, according to Appcelerator). But there’s a much wider gap among Android(s GOOG) developers, who much prefer developing smartphone apps than tablet apps. It’s pretty obvious why iOS developers are interested in the iPad — it’s still the most popular tablet brand. Microsoft isn’t selling many tablets, especially compared to the iPad and Kindle and Samsung tablets, but developers who are working with Windows 8 at all appear to be giving both smartphones and tablets equal interest. Meanwhile, it is interesting that despite Android’s overall dominance of the mobile device world — Android is technically the most common OS on tablets, according to IDC — developers for the platform are still more focused on smartphones, at least according to the survey. But the question probably isn’t fair: there’s no real distinction for Android apps. Developers need only add a bit of code to scale up their smartphone apps to accomodate a larger tablet screen. The average mobile developer surveyed writes his or her apps for 2.5 operating systems. There’s a pretty wide divide between the platforms developers in general do care about and those they don’t: Developers are interested in, in order, iOS, Android, then HTML 5/mobile web. There is still no third native platform in the running — yet. 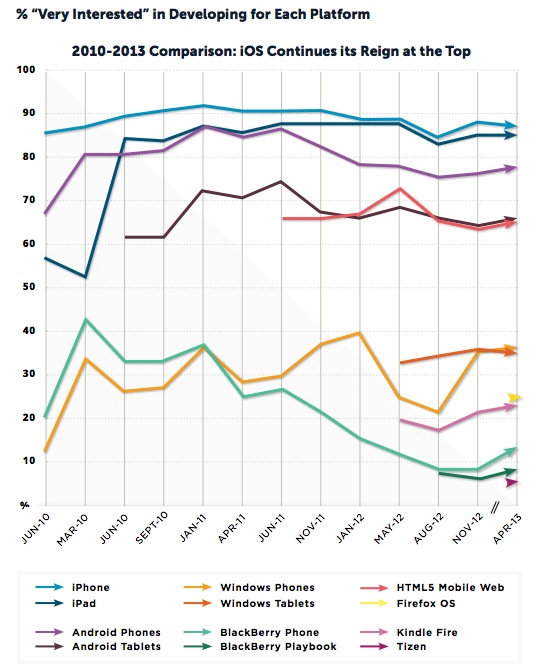 The most popular platform among those surveyed is still the iPhone. The least popular is Samsung’s Tizen. And newcomer Firefox OS is having a bit of a moment, attracting more interest than Kindle Fire and all BlackBerry(s BBRY) devices. Thank you Erica. Though I do wish media outlets would stop repeating IDC data. Their notoriously inaccurate data is often no more helpful than amplified noise.